When you all wreck your keyboards from drooling all over the place, don’t blame me…blame Rachael…who regularly sends my mental taste buds into overdrive with her mad-wicked-NOM-NOM-NOM recipes at her blog A Southern Fairytale! And I swear that one of these days I’m totally going to kidnap her use one of her recipes and force her at gunpoint to cook for me create some of this yummy goodness for ME ME ME my family. I met Anissa in February at the BlissDom conference in Nashville and like many people, I was immediately taken with her. There has been a lot of talk about her awesome cleavage, but what’s even bigger and more impressive, are her giant heart and wonderful smile. Anissa simply lights up a room and makes you feel as if you are the most fascinating person she’s ever met, so when Anissa sent me an email asking me to guest post for her… how could I say no? Being the food lovin’ gal that I am, I asked her what her favorite food was and she asked me if I had a recipe for Shrimp and Grits. HELLO! I am a Southerner, I am a Texan.. yes woman, I have Grits recipes. Now, if you aren’t a southerner, you are probably wondering what in tarnation we are talking about. 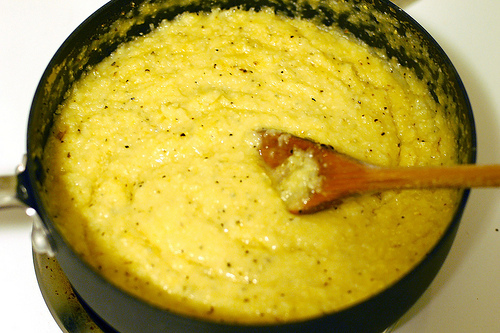 Grits are also known as polenta and are made mostly of ground corn. You can serve grits in many ways but my favorite are Garlic Cheese Grits. 1. Salt the water and bring to a rapid boil; gradually stir in the grits, using a fork. Cook covered until all the water is absorbed. 2. Stir in the butter, bit by bit and then carefully add eggs, cheese, garlic and cayenne. 3. Place in a buttered 2 ½ Quart casserole dish and bake at 350 for one hour and 20 minutes. If you’re feelin’ feisty: serve with some spicy shrimp. 2. toss the shrimp in a bowl with a light drizzle of olive oil, (tabasco) and the Seasoning mix until well coated, add to the pan and cook, stirring gently to turn the shrimp until they are pink. 3. This will only take a couple of minutes. 4. Remove from heat and serve with grits. Totally tonguegasmic and southern delight. Posted in: blogger stuff, guest posts, just for the fun of it, Mayhew niblets, these people are our friends. Cheese Grits. Mmmmmmmmmmmm. So many southern recipes I need to learn now that I live in Kentucky and not in the great northwest. You are so welcome!!! OOOOH you’re in my family (father’s side’s) stompin’ grounds. Perhaps the laws of physics cease to exist on your stove. Were these magic grits? Did you buy them from the same guy who sold Jack his beanstalk beans? Sorry. Not often you find a post that you can toss a “My Cousin Vinnie” quote at. I love “My Cousin Vinnie” I guess that I’m glad you found a place to use it? Ima try making those cheesy grits! That looks delicious! This is a dinner thing yes?? OMG! These sound simply wonderful. I know what I am having on Tuesday for dinner. MMMM!